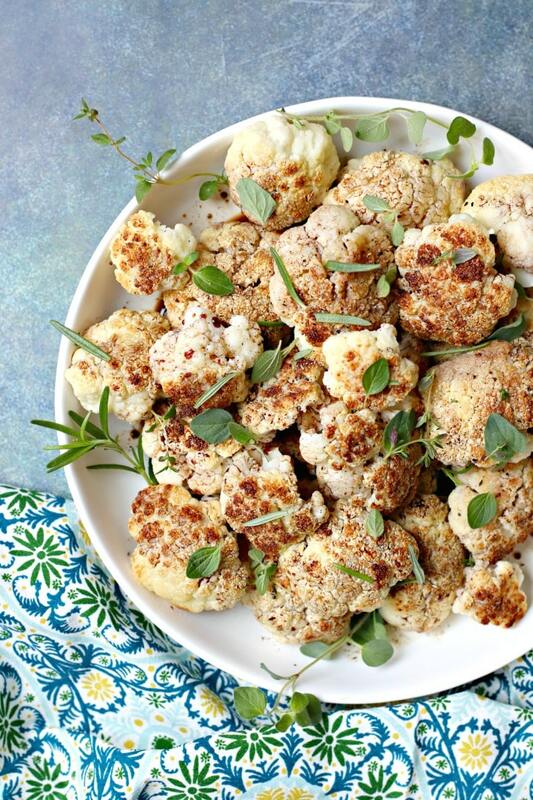 Blackened Balsamic Cauliflower is an easy and delicious recipe from The Plantpower Way: Italia by Julie Piatt and Rich Roll. It’s naturally vegan, gluten-free and healthy. And you only need a handful of ingredients to make it. I never thought much about how I prepare cauliflower. But now I have a new favorite! 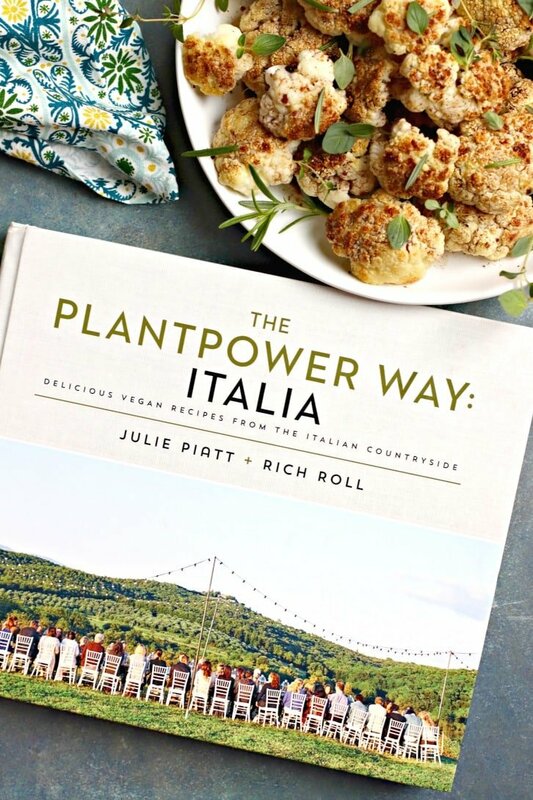 And it’s just one of many recipes to try from The Plantpower Way: Italia: Delicious Vegan Recipes from the Italian Countryside by Julie Piatt and Rich Roll. When I think of Italian cuisine, probably the first things that come to mind are pasta and cheese. And while this book does showcase those classics, they are all plant-based, including the cheese. In fact, Julie Piatt is an expert when it comes to making vegan cheeses. You may have her book This Cheese is Nuts! I am a huge fan of the Mac and Cheese with Garlic Spinach from it. This new books includes even more nut cheese recipes including Macadamia Cashew Burrata, Sicilian Orange Cheese, and Cashew Almond Mozzarella. And just like the original The Plantpower Way: Whole Food Plant-Based Recipes and Guidance for the Whole Family, this new Italian recipe collection has something for everyone. I’m excited to try the Olive and Sun-Dried Tomato Tapenade; Buffalo Cauliflower, Pineapple, and Porcini Bacon Pizza; Roasted Artichokes with Cashew Herb Cream; Cannellini Beans with Swiss Chard in Pistachio Oil; and Creamy Lemon Gelato. But first I had to try the Blackened Balsamic Cauliflower! You only need a handful of basic ingredients to make Blackened Balsamic Cauliflower. Instead of starting with the florets, the cauliflowers are roasted whole under the broiler with some olive oil and salt. Then the heads are separated into bite-size pieces and arranged on a serving platter. Balsamic vinegar is added, along with fresh oregano, rosemary, and thyme. And then it’s time to eat! Now let’s make Blackened Balsamic Cauliflower! 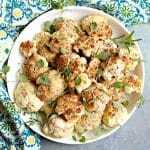 This is one of my favorite ways to serve up cauliflower. This whole food comes alive with the lively contrasts of the fireside roasted flavor combined with the distinct sweet acidic balsamic. Garnished with your favorite Italian herbs, this is whole food at its very best. This is a great recipe to include as a side at dinner or main at lunch. It can also mix beautifully in risotto or with roasted potatoes. Prepare the oven to broil. 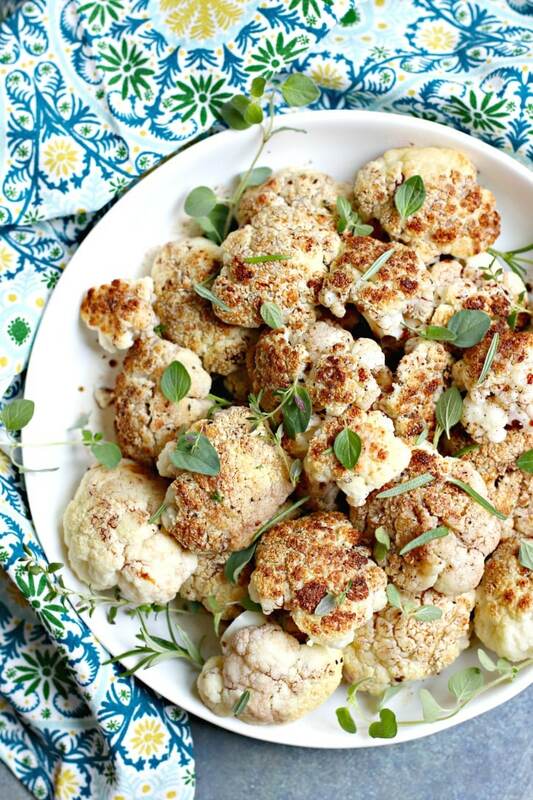 On a baking sheet, place both heads of cauliflower root-side down and brush them generously with olive oil. Sprinkle them with 1 tablespoon of the salt. Broil the heads of cauliflower until the tops become slightly blackened and the base of the cauliflower is a bit translucent and slightly tender. 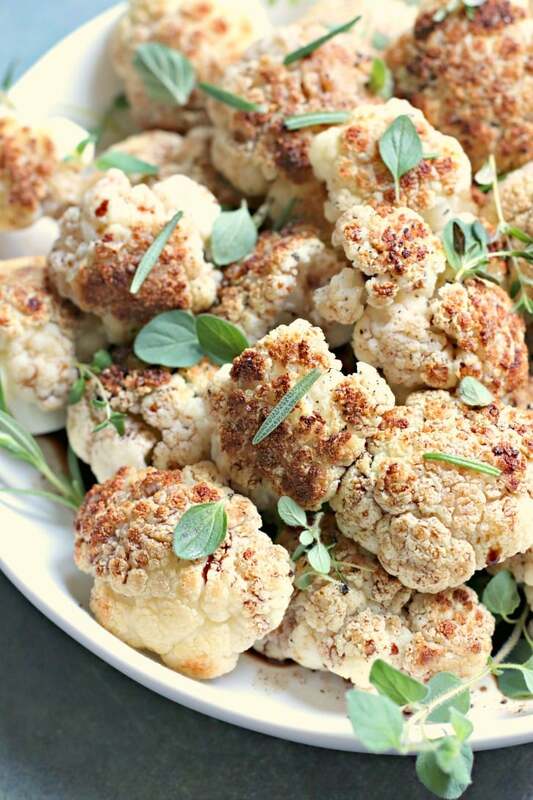 Remove the heads of cauliflower from the oven. On a cutting board, cut off the heads and separate them into bite-size florets. While they are steaming hot, arrange the florets on a serving plate and pour the vinegar over them. Sprinkle with the remaining salt and the pepper. Finish by sprinkling with fresh herbs. Looks great! I love cauliflower now! We only ate it raw when I was a kid. I think you’re going to enjoy this recipe, Leslie! That looks delicious! I can’t wait to check out this book! I think you’re going to enjoy both the recipe and the book, Allison! Can’t wait to try this recipe. I’ve made roasted cauliflower before and I love Balsalmic so this I know will be great. And I sure hope I win. I’ll gift it to my Italian father we’re helping transition to a more plant strong lifestyle. That is so sweet! Thank you for entering, and good luck! This recipe sounds amazing! Can’t wait to try it!! Thank you for sharing this, the book looks like it will be another good one by Rich Roll and Julie Piatt. The pineapple and porcini bacon pizza sounds crazy delicious! Italian food is so comforting and warm, I’m sure this book will be a treat for my family. Thanks again! Thanks for entering, Eric! I know you’re going to enjoy this book. Ahh this sounds good and super easy!